Great companies offer excellent service to the customers; and delivering the right information to customers at the right time is one way to provide excellent service. 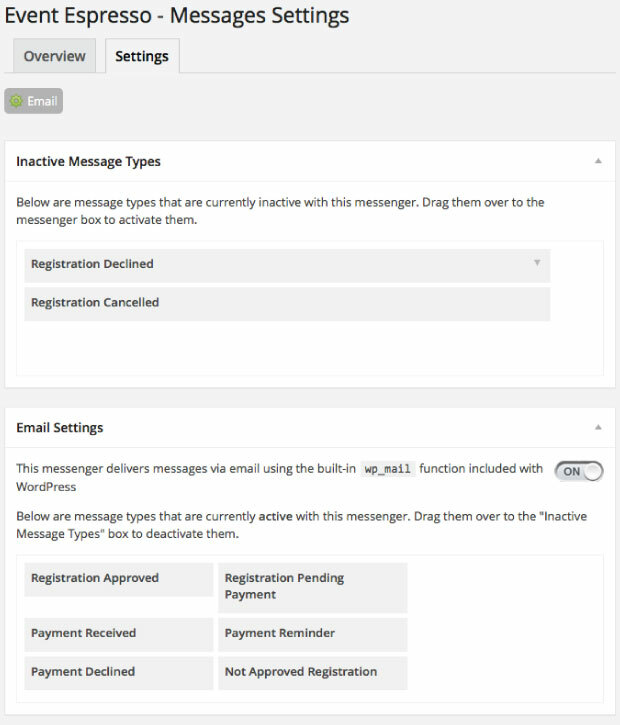 Event Espresso automatically sends payment and registration confirmation emails (according to your settings), and you can resend the confirmation emails at any time. 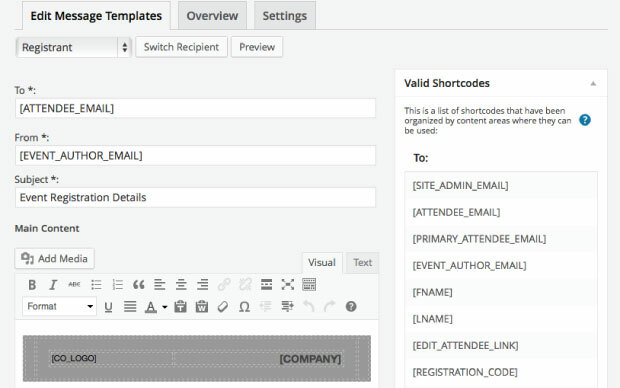 To offer the best service you can, our easy-to-use email shortcodes can customize any email for attendees and include any registration and payment information that the attendee will need. In Event Espresso 4 the confirmation email system has been replaced with a new system we call “Messages”. This new system is very powerful, flexible, and can be extendable and used for more than just email. Messengers will handle the delivery of messages. Hovering over the Messenger will provide you with an additional option to Edit the current message template. Clicking on Email will take you to the Message Templates Editor so you can edit the message template for an Event Admin or Primary Registrant (first person registered among a group) or Registrant. Each message type can be turned off, as well as different recipients (e.g. admins or registrants) can be turned off for different contexts. For example, you might only want Primary Registrants (first registrant among the group) to receive a Payment Reminder message instead of all the attendees that were registered together under that person. In the case that you don’t want to send all the messages for all the different contexts (see below), the Messages Settings page allows you to set a certain message contact active or inactive (turn it off or on, by message type). This message type is for messages sent to attendees when their registration status is set to Approved. This message type is for messages sent to registrants when their registration status is set to “Not Approved”. This message type is for used for recipients who have a “Pending Payment” registration status. This message type is used for all payment reminder messages. These messages are triggered when an offline gateway registration is submitted or when manually triggered via event administrators via the Transactions admin page(s). 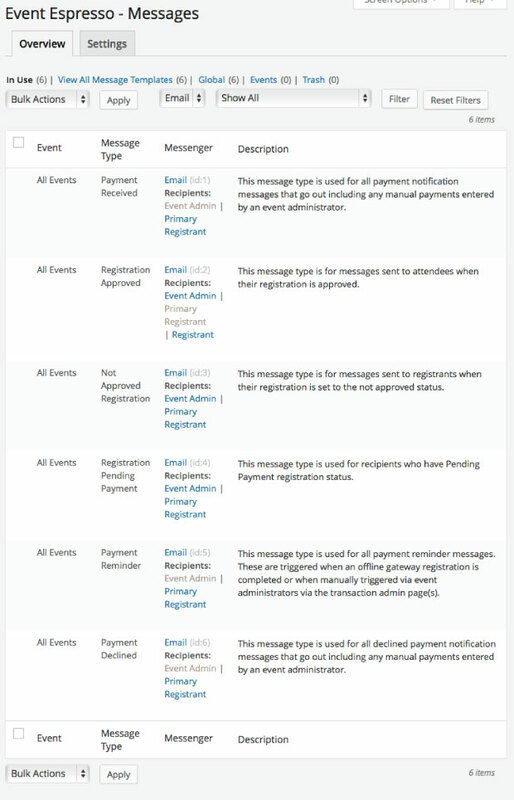 This message type is used for all payment notification messages that go out, including any manual payments entered by an event administrator. This message type is used for all declined payment notification messages that go out, including any manual payments entered by an event administrator. We want to make you look good, so we’ve utilized zurb email templates that are optimized (responsive) for mobile and desktop screens. See the Registration Approved message (above). Experienced programmers will see the potential to create custom messages and contexts for their clients. We’ve also made provisions that allow the email messenger css file to be swapped out with another css file by a developer.